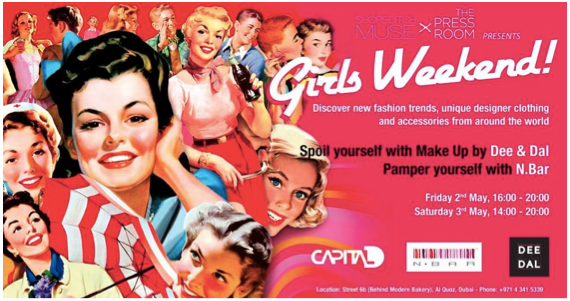 This weekend is all about the ladies 'Girls Weekend', an exclusive collaboration between some of the cities most coveted fashion and beauty brands, treating Dubai's fashionistas to two days of what you love best - shopping and pampering. The two day event will include limited edition fashion pieces from West L.A Boutique, makeup with Dee & Dal and of course no girls weekend is complete without being pampered by N.Bar, whose talented technicians will be on hand for anyone in the mood for a polish change or a quick head and shoulder massage! Venue : Capital D Studio, Street 6B, Al Quoz, Dubai.